November 3rd is Election Day. It’s an important day for St Johns County schools, as there is a 1/2 cent sales tax increase on the ballot slated to go towards our schools. In order to vote in this election, you need to be a registered voter. Click here for details on how to register and to find out your voting percent. October 5 is the registration deadline! More details to come on this important issue as we get closer to the date. 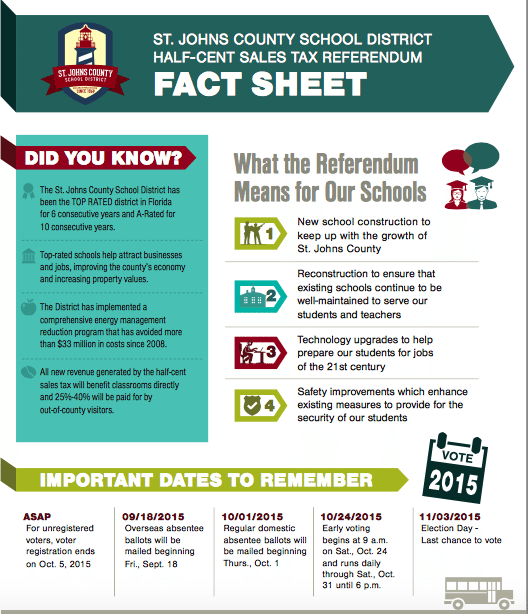 In the meantime, below is the St John’s County Fact Sheet on why to vote. My personal opinion, we can’t continue to have A schools if we don’t get some influx of funds from somewhere. This is such an important vote! We are growing exponentially and can not keep up with the physical demands. Right now, it is estimated that we have enough students in portable classrooms in our district to fill 9 schools. PLEASE get out and vote and tell all you know about it!